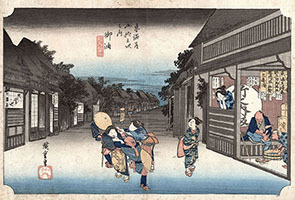 Hiroshige was born in Edo. At the age of fifteen he was admitted to the studio of Utagawa Toyohiro, an artist with a preference for classical and landscape subjects. He also studied Nanga painting under Ooka Umpo. In 1812 he adopted the name Hiroshige. The first prints to be published under his own name were bijin ga (prints of beautiful women), a few surimono and landscapes in small format. 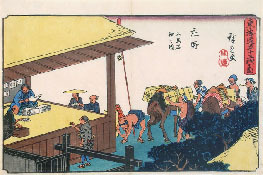 In 1831 Hiroshige designed a series of Sights of Edo which was immediately successful. 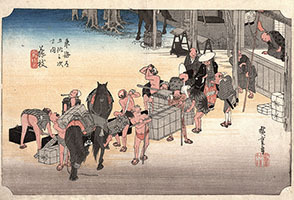 In 1832 he accompanied the annual procession from Edo to the emperor in Kyoto along the Tokaido. Along the way on this journey, he sketched the scenes which he later put into the fifty-five prints which made up this famous series portraying the official fifty-three post stations on the route. The series was revolutionary in its departure from the classic tradition in landscape painting. His scenes had a naturalness and sense of immediacy about them that provoked instant popular appeal. This established him as the painter of Tokaido scenes and, subsequently, he produced some thirty similar series on the same theme. Many highly successful landscape series would follow such as the Sixty-nine Stages on the Kiso Highway, the One Hundred Famous Views of Edo, the Thirty six Views of Mount Fuji. In his declining years, in addition to landscapes, he created an unique style in depicting birds and flowers and left many remarkable prints. His lyrical expression of nature and the elements reflected his gently romantic lifestyle and he brought Japanese landscape painting to its peak.